Headphone wires are quite annoying so we can see why Sony has decided that sticking an MP3 player into a pair of headphones that can also double (triple) as a speaker is a good idea. 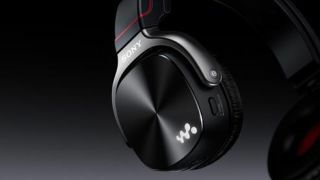 The NWZ-WH505 comes with 16GB of on-board memory (that's around 4,000 tracks), 20 hours of battery life and a 40mm dome type headphone driver unit that Sony says will deliver "rich, powerful bass". The lower-spec NWZ-WH303, meanwhile, comes with 4GB of storage - a paltry 1,000 songs - and a slightly lower-spec 30mm driver unit. Both sets claim 20 hours of battery life, various sound modes for music playback and you can use a wire to play other audio from computers, phones, tablets and so on. In the age of Bluetooth headphones and Spotify subscriptions, we're not sold on the jack-of-all-trades approach and not convinced that the speakers will be up to much. Still, if your pulse has quickened and you're involuntarily salivating at the prospect of your headphones, speakers and MP3 player becoming one, we're sorry to say that there's no word on availability or pricing just yet.